The panel allows youth from across the country to showcase their talents, achievements and to talk about their challenges, strengths and the support they have received, while working hard for the benefit of their people. Learn more about the National Youth Panel and past Youth Role Models. Congratulations to this year’s National Youth Panel finalists! Tara Atleo is a member of the Ahousaht First Nation of the Nuu-chah-nulth people. Tara recently graduated from Vancouver Island University with a Bachelors of Business Administration Degree with a focus on Economics. From 2010 until now, Tara has been the manager of Ahousaht’s only eco-tourism initiative, named Walk the Wildside Trail. The WildSide Trail is Ahousaht’s first entry into the eco-tourism industry intended to demonstrate and encourage sustainable economic development while inspiring community members to venture into other tourism activities. The WildSide Trail is a non-profit operation dedicated to job creation within the Ahousaht community while demonstrating ongoing use and stewardship of traditional of lands used by Ahousaht people for thousands of years. Dalyn Bear of the Whitecap Dakota First Nation received his Business Administration Diploma in 2010 and continues to further his education in the lands sector, receiving his Indigenous People Resource Management Program Certificate in 2012; and completing the National Aboriginal Land Managers Association Certification Program in the fall of 2012. Currently, Dalyn is employed as the Lands Manager for his community where he continues to display leadership and dedication to his community, supporting economic development, land tenure, environmental management and community resources. He is currently involved with Dakota Dunes Hotel & Resort, a 25 million dollar project and continues to be a part of future economic development opportunities including creating awareness within youth and young adults to continue on with their involvement with sports and recreation. Andrew Chase of Metepenagiag Mi’kmaq Nation recently graduated from the New Brunswick Community College (NBCC) with a Business Administration – Sales and Marketing Diploma. While attending NBCC, Andrew quickly became involved with his class activities, fund raising to attend business galas, with chances to meet stars and moguls like Donald Trump, Gene Simmons, Rudy Giuliani and Danny Williams. Involvement didn’t end there as Andrew, along with his close friend, Daniel, spearheaded the college’s first ever Movember campaign and raised over $850 in funds for prostate cancer research. Previously, he sat as a member of the Metepenagiag Youth Council and he is a Board of Director for MYPIE – Miramichi Young Professionals and Involved Entrepreneurs and is an active member of the business community in the greater Miramichi area. Devon Fiddler of Waterhen Lake First Nation graduated from the University of Saskatchewan with an honors degree in Bachelor of Arts, Aboriginal Public Administration. In 2011, Devon obtained her Technician Aboriginal Economic Developer (TAED) certification through Cando. This summer, she was also accepted into the Indigenous Women in Community Leadership Program through the Coady International Institute of the St. Francis Xavier University in Nova Scotia. 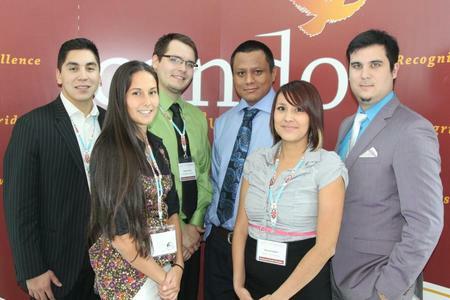 Currently, Devon is employed as a Business Development Coordinator for the Meadow Lake Tribal Council’s corporate arm MLTC Resource Development LP. She works with entrepreneurs of Meadow Lake First Nations through helping them to develop their business ideas and plans and assisting though assessment and skills support. Zac McQue of Curve Lake First Nation is currently enrolled in the International Trade program at Sir Sanford Fleming College. Zac presently sits on the First Nations Gaming Fund and Economic Development Committees which led him to work with his First Nation’s Economic Development office. Zac has been a part of many exciting opportunities including attending the Global Leader Centre put on by Global Vision Junior Team Canada, the Global Vision National Youth Ambassador Caucus and the MY SUMMIT Youth Counterpart to the G8/G20 as the First Nations representative. Zac was also invited on the Economic Development Trade Mission to China and Malaysia and has recently been selected to lead a group of Canadian youth to the APEC CEO summit in Vladivostok, Russia in early September 2012.